There are various supplies and many different kinds of materials that could be useful when creating a beautiful and correctly made fashion accessory. Using the correct tool can simplify making jewelry and other fashion accessories. Adhesive for various materials is as the name already implies meant for gluing several materials (read the instructions of the adhesive for the specific materials). 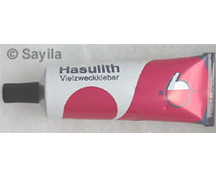 With the help of this adhesive, you will for example be able to glue beads of various materials to each other in order to create beautiful, unique beads. A bead board is the perfect tool for designing your own jewelry. You can place the beads and accessories of your jewelry design in the right position on the bead board to get a good view of your design. A bead board ensures that the beads will not roll away. By using a bead board, you have the opportunity to make changes in your design without any effort. Cutting pliers are for example meant to cut steel wire, head pins and eye pins. When cutting wire and jewelry parts, always use special safety glasses to protect your eyes. Dividing pliers are specifically meant to open strong, rigid jump rings, such as the chain links. 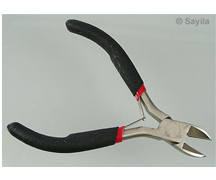 Flat nose pliers are the correct tool for fastening crimp beads/cord crimps and opening/closing jump rings. 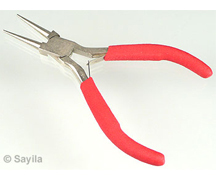 Multi wire pliers can generally be used for squeezing, bending and cutting. 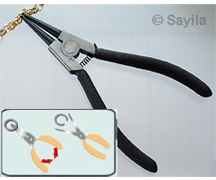 Although these pliers are quite useful, it does not automatically replace the other pliers. Creating pretty, symmetrical eyes and loops can for example be quite difficult with multi wire pliers. 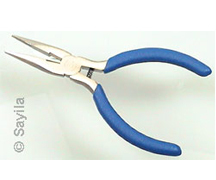 Round nose pliers are mostly used to make eyes/loops and to open/close jump rings. 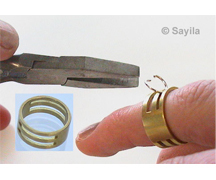 If you have difficulty with opening jump rings, you could use a special metal ring that makes it easier to open jump rings. 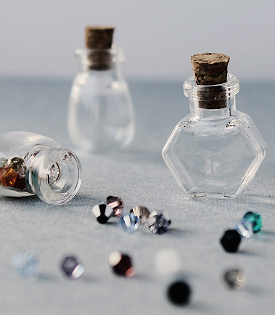 Strass glue is specifically used to glue flat back rhinestones and pointed back rhinestones in the special frames of certain metal pendants and beads, but strass glue can also be used to glue flat back rhinestones on even, non-absorbent surfaces, such as a mother-of-pearl pendant. 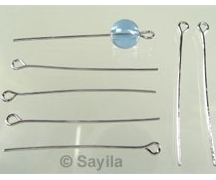 It can be recommended to use special wire needles for stringing certain beads. 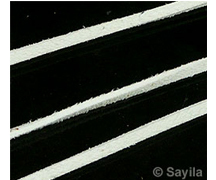 Wire needles are longer, thinner and more flexible than the average needle. Do you have difficulty with threading the wire through the eye of the needle? Then you might want to use a “self-threading” or “easy-eye” wire needle. 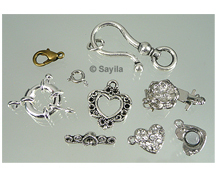 Many different kinds of wire and chain are available for creating jewelry. Each material has its own advantages and disadvantages and is often suitable for a specific design/technique. Furthermore, certain beads demand a specific kind of wire. For instance, freshwater pearls can best be threaded on steel wire; imitation suede lace is not suitable for freshwater pearls, since the holes of the pearls are too small for the lace. 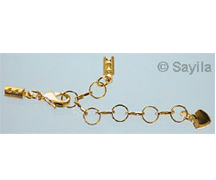 Chain can be used for a charm bracelet extremely well, but it can also be used in a necklace. Because chain consists of links, it is very easy to use in various ways. There are many uses of chain: for instance, you can use the links of the chain as a jump ring; you can make small tassels from the chain; you can fix pieces of chain to a bookmark; you can combine imitation suede lace with chain. Chain is available in various shapes, sizes and colours. 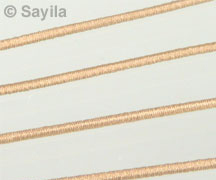 This thin and elastic wire is extremely suitable to use for creating bracelets. Available in various sizes and colours. Because of its availability in various sizes, there is almost always a wire that fits through the hole of your beads. 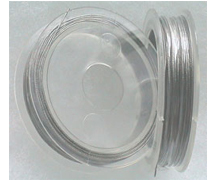 This wire is quite suitable for bracelets. 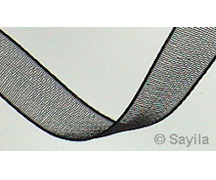 It is often thicker and stronger than elastic nylon wire; the hole of the beads must therefore not be too small or the bead will not fit on the wire. Imitation suede lace can be used for various designs. It is available in various sizes and colours. Because of the size of the lace, only beads with a large hole can be threaded on imitation suede lace. Imitation suede lace can easily be knotted which can give a playful effect to your jewelry. Memory wire is a rigid, metal spiral to string beads to. 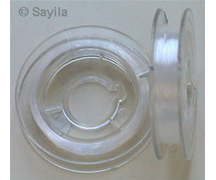 It is a thin steel wire that is perfectly suited for beads with a small hole, but it is also possible to string beads with a larger hole on the wire if you make a larger eye at the end of the memory wire, if you string a bead with a small hole at the end or if you use caps at the end. Memory wire is available in the specific sizes for a bracelet, a ring or a necklace. 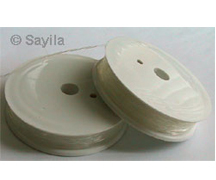 Nylon wire is often used as stringing wire; it is flexible, but not elastic. 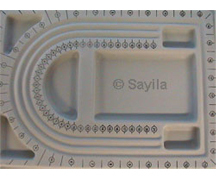 Because of the wire’s flexibility, it can be used extremely well for intricate stringing patterns. 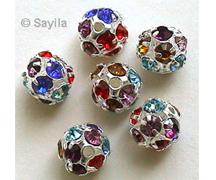 It is also very suitable for necklaces with “floating” beads, because the wire is transparent. Ribbon is a gorgeous material; it can for example be used to create a necklace. String a large, beautiful pendant on a ribbon and you have created a classy piece of jewelry in a flash. 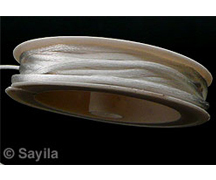 Silky cord can be used in the same manner as wax cord. The gorgeous gleam of this cord gives your jewelry a glamorous appearance. Beads with a small hole will not fit on this cord. 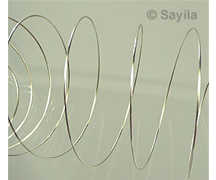 Steel wire is often used for creating necklaces and bracelets. 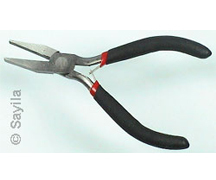 Cutting pliers specifically meant for cutting steel wire are necessary to cut the wire in the right size. When cutting steel wire, always use special safety glasses to protect your eyes. While working with steel wire and while wearing/storing jewelry made of steel wire, it is also important to treat it with care to avoid kinks in the wire. Available in different sizes and colours. Because of its availability in various sizes, there is almost always a steel wire that fits through the hole of your beads. 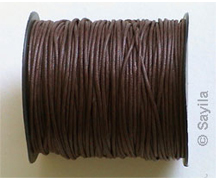 Wax cord is suitable for all sorts of designs, from bracelets to necklaces. Wax cord is strong and not elastic. Available in various sizes and colours. Beads with a very small hole cannot be threaded on this cord. Wax cord can be knotted in order to give your jewelry a playful look. 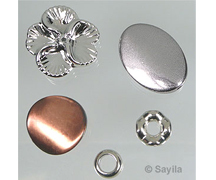 Below you will find several items that are useful to have if you make your own jewelry. Caps can be used to accentuate a specific bead or to give your jewelry that finishing touch. 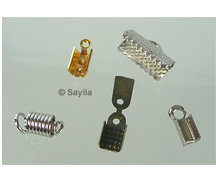 There are many different kinds of clasps, from basic to extremely decorated clasps, from magnetic to screw clasps. Finding the right clasp for a certain piece of jewelry can be quite challenging. 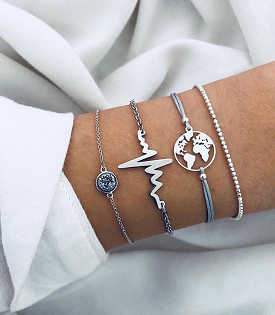 It can therefore be recommended to think about the visibility of the clasp when wearing the jewelry; for instance, the clasp of a bracelet is often visible while the clasp of a necklace is not always visible. The clasp can be the eye-catcher of your jewelry; there are clasps available that are specifically meant to function as eye-catcher of your jewelry. It is also important to take the owner of the jewelry in consideration when trying to decide the right clasp for the jewelry; for instance, if the owner is likely to have difficulty with opening/closing the clasps, it might be a good idea to use a clasp that is easy to open/close, such as a magnetic clasp or a toggle clasp. 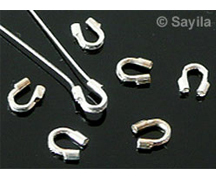 A connector can be used as a link between two parts of a piece of jewelry and can be fixed to for example eye pins or cord crimps using jump rings. If you create a piece of jewelry made of wax cord or imitation suede lace, cord crimps are crucial for finishing your jewelry design. You can fix a clasp or ring to the eye of the cord crimp. Cord crimps are available in various shapes, sizes and colours. 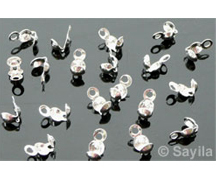 Crimp beads can be fastened by squeezing it with flat nose pliers. They are for example used to finish jewelry made from steel wire and to keep beads in place. A divider is an accessory for making a piece of jewelry that consists of several wires. It keeps the wires separated and it can be used to fix multiple wires to a clasp. An extension chain is quite convenient, because you can always adjust the size of your jewelry. For instance, a necklace can be made longer or shorter depending on your outfit. When you fix one extension chain to both sides of your jewelry piece, the extension chain can also function as a safety chain; make sure you can still take your jewelry off without removing the safety chain. 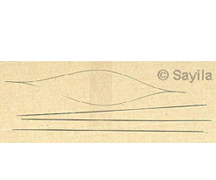 Eye pins have at one end of the pin a small eye and are for example used as a connector. You can make beautiful pendants with the help of an eye pin and you can even make an entire necklace from just beads and eye pins. Head pins resemble eye pins except for the eye at the end of the pin. 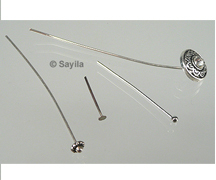 At the end of a head pin, you will find for example a small ball or a flat end that stops the beads from falling off (if the hole of the bead is bigger than the end of the head pin, you can place a cap between the end of the head pin and the bead). Head pins can be used to make a pendant from a bead. 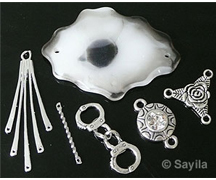 Jump rings can for example be used to fix pendants and clasps to jewelry. 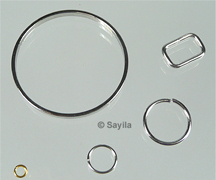 Jump rings are available in all sorts of shapes, such as round, oval and heart-shaped. 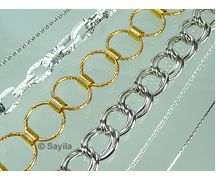 A jump ring can also be used to replace an extension chain at the end of a necklace or bracelet. Pinch caps are small balls with an eye that you can place over a crimp bead by squeezing it. These caps are used to finish a piece of jewelry; you can fix a clasp or a ring to the eyes of the pinch caps. A wire guardian is used to protect a loop of steel wire and keep that loop longer in optimal condition. A necklace of steel wire is often finished using a crimp bead and a loop; a wire guardian fortifies this loop. Beads are obviously essential when creating your own jewelry. 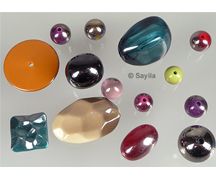 Beads are available in all different kinds of materials. 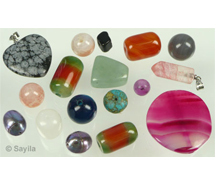 We will briefly highlight various kinds of beads. 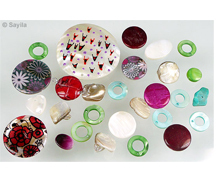 Glass beads are often used for a jewelry design, because it is available in many different shapes and colours. Glass beads are available is many variations, such as glittering faceted glass beads, glass beads with silver or gold foil and Italian-style milifiory (3D-effect) glass beads. Glass is quite a heavy material. Although glass is quite a strong material, they can break if they fall or if they are treated roughly. ATTENTION! If glass beads break or if glass splinters have broken off from the glass beads, the broken pieces of the beads can be sharp. 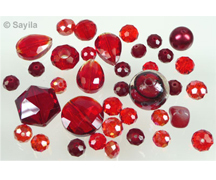 Glass beads crystal are made of crystal glass; these beads are often faceted, have a glamorous gloss and sparkle brilliantly. Although glass is quite a strong material, they can break if they fall or if they are treated roughly. ATTENTION! If glass beads break or if glass splinters have broken off from the glass beads, the broken pieces of the beads can be sharp. 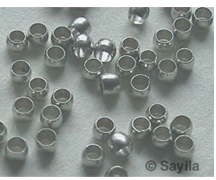 Metal beads are in general strong and heavy, but there are also metal beads with a lighter weight, such as metal filigree beads and wafer-thin metal pendants. There are beautifully decorated metal dividers, connectors and settings for rhinestone flat backs and pointed backs. There are also many cute charms and small pendants. Metal look beads are made of a synthetic material, but they look similar to metal beads because of the metal look beads’ colour. If you worry your jewelry design will be too heavy to wear, you could decide to use metal look beads instead of metal beads. 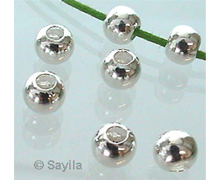 Metal look beads can however be damaged easier than metal beads. 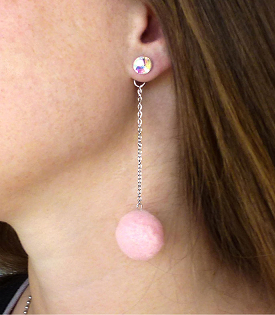 Mother-of-pearl beads are as the name implies made of mother-of-pearl. Mother-of-pearl beads are available in different shapes, sizes and colours, such as flat round beads or large flat heart-shaped pendants. 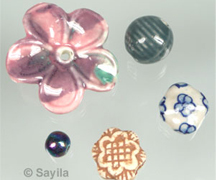 Mother-of-pearl beads have a special gloss effect that is typical for mother-of-pearl. Natural stone beads are as the name implies made from genuine natural stone, such as genuine freshwater pearls, beads made from coral and (semi) precious stones. They are often somewhat more expensive than other materials, but they look very elegant. 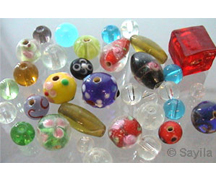 Plastic beads are very light in weight and can be used for all kinds of fashion accessories. Plastic beads are available in all sorts of different sizes, shapes and colours, such as beads with glitters and beads with a cheery print. An advantage of plastic beads is that they do not easily break. 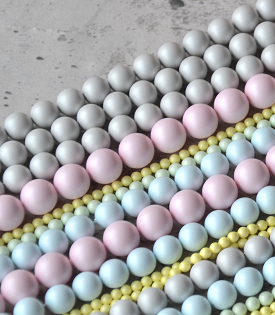 Porcelain and ceramic beads are made of hardened clay due to heat after which the beads are eventually glazed. They are available is various sizes, colours and shapes. If you want to create a daring, sparkling jewelry piece, you can use strass beads or strass stones in your design. You could glue strass flat backs or pointed backs in their specific settings or you can use beads, such as certain roundels or balls, that already contain sparkling strass. Using wooden beads can give your jewelry a beautiful natural look. 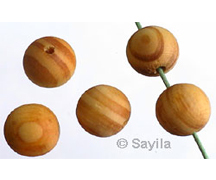 Wooden beads are generally not heavy; if you want to make a light piece of jewelry, wooden beads can be a great alternative for, for example, glass beads, ceramic/porcelain beads or metal beads. Wooden beads can however also fairly quickly show discolorations due to the sun and wear and tear. 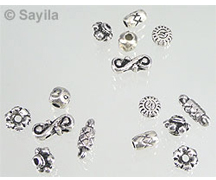 925 Silver beads (sterling silver) do not damage or discolour as easily as metal beads. 925 Silver beads can blacken somewhat, but this can be removed by polishing them with special silver dusters or silver polish. 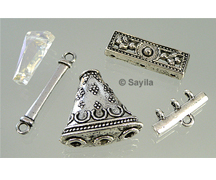 The numbers 925 on a 925 silver bead or jewelry accessory indicates that it is made of 92.5% silver. 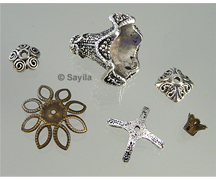 The other 7.5% consists of various kinds of metal, because pure silver is too soft to be used solely. Caution! It is very important that you pay attention to your own safety when creating jewelry. The tools and other materials that are used when making jewelry can be dangerous if used incorrectly. For various techniques wearing among other things special safety glasses or safety gloves are very important (think for example of cutting metal wire, headpins or eye pins).